Ever since I can remember, my sisters and I have been called bookworms. Folks who called us that were sometimes frustrated and sometimes delighted. We didn’t mind. What better things to do with one’s mind than to travel, fantasize, solve mysteries, and dream of love, all in the comforts of home? We visited the local library regularly (and paid enough overdue fines to pay the librarian’s salary). Our mother provided books on a monthly basis as payment for working in her bakery. We acquired an entire set of The Bobbsey Twins and Nancy Drew mysteries during those years. During two different occasions, our half-sister Katharine was bedridden with rheumatic fever. She read to us almost nightly from the Peace Greenfield books by Ruth Alberta Brown. We were crowded into a small sewing room around her hospital bed, but we didn’t mind; the suspense and emotions were worth the cramped space. Trixie Beldon, Nancy Drew, the Hardy Boys, the Tuckers, the Happy Hollisters, and the Bobbsey Twins kept us occupied until we moved on to Laura Ingalls, Anne of Green Gables, and books written by Gene Stratton Porter. Long before Laura Ingalls or Anne of Green Gables became known through film or video, we had followed their stories from book to book. Sadly to me, my kids hardly know who most of these story people are! Summer nights found us with windows open and crickets, Katy-Dids, or frogs serenading us outside the windows as we read “one more page” or “one more chapter” until way past our bedtime. Winter nights, when we knew there’d be no school the next day, we’d kept our bed lamps on until the wee hours of the morning. On another night during a visit with our sister Loretta and her family in Nebraska, I heard Alice sniffling in the bed beside me. “What’s wrong with you?” I asked, half-closing my book. She turned the pages in Anne of Green Gables and replied tearfully, “Be quiet. Matthew just died.” The springs on the bed creaked as I laughed and she cried. Most of my children have inherited those same traits: reading into the night. My older kids are into C. S. Lewis, Ted Dekker, Frank Peretti, Jeanette Oke, Lori Wick, and Karen Kingsbury. Many a night I’ve caught a kid reading in his room when I thought everyone was asleep. I have a hard time parting with books. 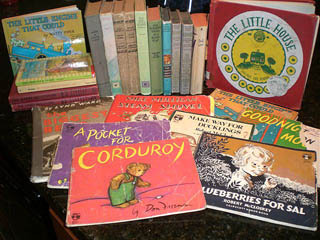 The other day I was unpacking boxes of books that I’d stored during a remodeling project at our house. Most of them are books that my kids have outgrown—but I haven’t. Blueberries for Sal, Make Way for Ducklings, Little Mommy, Goodnight Moon, Corduroy, Jenny Wren’s New House, Mike Mulligan and his Steam Shovel, The Biggest Bear, Madeline, The Little House, and many more show by their wear that they were kids’ favorites when my gang was smaller. So I put them on the “to keep” pile. For some reason, the keepers pile is larger than the give-away pile, so is the pile of books belonging to my older kids. I’m not always sure what to do with my books. I wish I had a room in our house large enough for bookshelves from ceiling to floor. At our house, the bathroom is always a place for reading. That’s why there’s a basket stationed in one bathroom and the song rack from an old church pew on the wall in another one. I rotate the books according to the seasons, and I can tell that they are read by throne-sitters. I figure if they’re going to read there, I’ll make sure there’s good stuff to dwell upon while they’re taking up throne space. While I believe (and practice) good care of books, I really don’t mind when a cover is loose or a few pages are wrinkled and worn. It tells me that this book has been a friend. One day my sister-in-law introduced me to an author of the 1900’s, G.H. Henty. I called the man who was re-publishing the books and asked him for a recommendation of the best one in the series of historical fiction. I purchased a copy of In Freedom’s Cause (in paperback) and read a few pages. It was over my head in details and frankly, just not my kind of story. Then I purposefully placed the book on an end table in the living room. That evening, just as I had hoped, one of my tweens picked it up and started to read. So Tim understood exactly why I asked him not to read the book until I had finished the last page. “Yes, I do,” I replied, not admitting that I only wanted to read it to pique his interest. “You haven’t even read the first page, have you?” he asked. “Sure I have. I’ve read most of the first chapter.” I began describing the characters in the book to him. I’ll never tell that I had read it only so I could tell him I did! Eighteen books and quite a few years later, Tim still claims In Freedom’s Cause as his favorite book by G.H. Henty. He now has a hard copy to replace the paperback he received years ago. “I have read this book so much, I can pick it up and open it to any place, and I know exactly where I am in the book,” he tells me. When my oldest, Ben, first read Ted Dekker and Frank Peretti, he begged me to read one of the books. I did so, because he asked. I was up until three o’clock in the morning, trying to find my way through numerous plots, suspense and mystery. Since then I’ve read more than one, even though this style is not my favorite. The tendency of modern authors to write stories with numerous characters involved in several different story plots makes more challenging reading for me. I’m probably giving away my age, but the books I grew up with had one character and story plot, so I tend to enjoy books which follow that pattern. When my kids were small, I read to them practically every day. As they got older, they read to younger siblings. It was a great way to kill two birds with one stone: homework read out loud and a younger sibling being entertained. I believe reading helps with concentration, comprehension, spelling, and increasing vocabulary. In fact, one year we asked our second grader to be excused from a play at his school. During practice for the play, he was allowed to go the library, where he read. Spelling test results were proof positive of the benefits of reading. Whereas I normally spent thirty minutes each evening going over spelling words with him with little success, things changed during that period of his life. His “sentence” to the library resulted in an A in spelling with less effort than it had taken to pass with a low C.
So these days, even though I’m over fifty, you’ll often find me with my nose in a book, oblivious to my surroundings. Sometimes I’m reading a favorite, and sometimes I’m engrossed in one I’ve never read before. Call it escape, imagination, or whatever you will; it’s still good for my mind. The way I see it, I’ve got my own exercise gym for the mind right here in my house.